The God Thief is Live! Now infamous for his exploits, Jack Myst is a master thief. As a member of the Thieves Guild he has fought assassins, reavers, and even a devil—but now he faces his greatest challenge yet, the rank of guildmaster. Ascending to the office after defeating Skorn at Margauth, he launches a daring plan, one to steal what cannot be stolen. But Skorn has retrieved the fragments of an ancient artifact, and has begun construction on the Necrolith, the beacon of ending. He issues a king’s bounty on Jack’s head, turning governments and guilds against him. Hounded by soldiers and hunted by assassins, it will require all of Jack’s skill to triumph over Skorn. He couldn't be more excited. Thief in the Myst is now live! Thief in the Myst is officially live! I'm so excited to give the link for the second book in The Master Thief series. And just wait until you see what Jack does at the Boneyard. Here's the link. Jack Myst infiltrated the Thieves Guild to avenge his mother’s murder, but never expected to find a home. Now a master thief, he grapples with his new identity as he unravels the secrets of the fallen Guildmaster. The trail of questions will lead to a shocking truth, that his foe is a remnant of an ancient race, the very devil of Lumineia. Seething with hatred and cast out by the thieves, Skorn is not without allies. Forcing an assassin into service, he journeys to the forgotten fortress of Margauth, where a cult worships him as a god. With such an army at his command he seeks a return to power, and two keys that unlock a legendary vault. The Vault of the Eternals. The Age of War is officially live! Relentless in their pursuit of perfection, the rock trolls have waged war for millennia. Legendary warriors, vast armies, and even dragons have fallen before their might. But now their enemy comes from within. Rising to the throne by right, King Sybrik seeks conflict even as his people dwindle and perish. His thirst for blood will see no end. Unless Tryton can stop him. Endowed with strength, gifted in battle, it is his honor that sets him apart and leaves an indelible mark on friend and foe alike. Now it will require all his skill to end the age of war—before Sybrik incites a conflict that cannot be won. But Sybrik has his own plan, and hunts a weapon lost by time. If he finds it he will become powerful beyond measure. And all that lives will be his prey. New Trilogy for 2015! You won't believe who the main character is! Announcement time! This year I am planning on writing a story both unique and powerful within the Chronicles of Lumineia. Written from the perspective of King Tryton himself, it will detail the story of one of the most legendary of warriors. Rock trolls have always been one of the most interesting races within my series. Their history and heritage are things I've wanted to explore for years, and this trilogy will allow me to do that. Feel free to post your thoughts below! 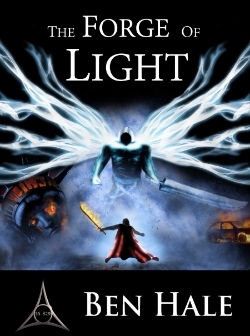 The Forge of Light is officially live on Amazon. 14 months after publishing The Last Oracle, The Forge of Light marks the fifth and final installment in the White Mage Saga. With the short story Assassin's Blade also released this week, The White Mage Saga now comprises six titles. This brings my total books to ten in just two and a half years. I have discovered I love to write, and I'm so grateful to all of you for making it possible. In an odd coincidence, today is also my ten-year wedding anniversary. Even after all this time we are still one soul in two bodies. Eternity is not enough time with such an incredible woman. I love you Sicili! Merry Christmas and Happy Holidays everyone. I hope you enjoy my latest books! I am so excited to announce that Assassin's Blade is officially live on Amazon. This prequel novella expands the White Mage Saga, and provides insight into the Swordsman, and Hawk. It is my first novella ever, and I can't wait to see how it recieved. All of my beta readers said it is one of the best things I have ever written. This release kicks of my Nine days of White Mage event. In the next few days I will post teasers and secrets about the history, and end with publishing the final book in The White Mage Saga, The Forge of Light.Here's the Link! Forge of Light is slated for release on Dec. 18th! I can officially announce the release date for Forge of Light as December 18th!!! I can't believe this will end my second series in the Chronicles of Lumineia. I've been working on this series for a year and a half, and coming to this point is bittersweet. There's so much to do in the next 13 days. 4 drafts to go, including a beta reader draft and a vocal draft. Also, Assassin's Blade will be released in just FIVE DAYS. I can't believe it. This prequel is so awesome, and writing about the Swordsman is incredibly fun. What do you think? Is he your favorite? Or someone else? Impact of the Fallen is Live! Impact of the Fallen is officially live! Here's the link for all of you waiting to continue the White Mage Saga. I'm so happy it's done, and not a moment too soon. My wife is due with our 5th child this thursday, and she started having contractions this morning. I hope you enjoy the book, and wish me luck! Print Books are finally completed! I am so excited to announce that I have finally set up print versions of all of my books! They should be available in the next few days. I have also redone the cover for Seven Days and couldn't be happier. I finally have King Tryton on the cover. Any thoughts?